Two guitars, two vocals, kick and hat. Mostly acoustic blues ranging from sweet and mellow to hard driving. Lots of slide guitar as well. Eleven tracks that we're proud to offer you. 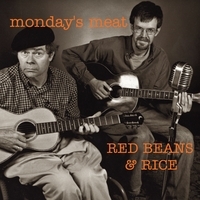 Red Beans & Rice are a loose affiliation of two, an acoustic duo playing an entertaining and engaging mix of blues old and new. Mr. Rice (Carter Ruff) plays slide guitar and has been known to howl at the moon. "Red" Beans (Dave Hunt) is a gentler man with a touch on the guitar that is sweetly complex, and a voice as smooth as butter on a burn. My mother's mother grew up in New Orleans. According to her, Monday was wash day, and red beans and rice was supper for that day of the week, since all it required was to be put on the stove and allowed to cook. Put us on and let us cook. This album was recorded studio live, with no overdubs, and with as little studio trickery as we felt we could get away with. Light shines out through the cracks.